Not long ago I received an email proposing that I test a new line of 'indestructible' micro SD memory cards. To be honest I have never come across a micro SD card that has yet to be destroyed and I have been using them for years. SD cards on the other hand are easily killed. Curious I requested they send me one, and two days ago I received it. 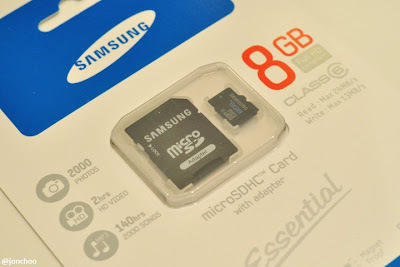 The card turned out to be a Samsung branded 8GB class six micro SD card. It looks bog standard and nothing on the packaging claims that it was indestructible, but a quick search later reveals that Samsung does indeed claim that the cards are water proof, shock proof and magnetic proof. The micro SD card does look as classy as Samsung claims, though I do not see how these will affect its usage. In any case I decided to see if I could kill it. Nobody would ever use their memory card in water - after all, even if the memory card itself was water proof, most devices aren't. There are exceptions of course, but there aren't many. Still I am sure there are times when even I accidentally left them in the washing machine. So that was exactly what I did - leaving it inside a pocket (but making sure it is zipped so as I don't lose it! ), I left our Bosch washing machine to do its worst - a one hour 30C cycle and a couple of spins at 1200 rpm. Needless to say the blessed card survived the arduous cycle of being trapped in a washing machine. Not giving up, I attempted to kill it by placing it between two fridge magnet but to no avail. Finally I gave it a few stamping but it wasn't enough to kill it. At the end of the day I decided that the little blighter had put up a good fight and spare it further physical abuses. It was time to check out how it performs. The Samsung 8GB micro SDHC card here is graded as a class six card, which means it has to be able to offer a minimum of 6MB/s write speed. I ran it through a benchmarking application, and delightfully found that the write speed was averaged at 10.5MB/s. That's equivalent to a class ten card. On the other hand I found the read speed to be disappointing, only capable of around 17.8MB/s, in comparison to a Sandisk card I have which offers a speed of 49MB/s. Still at 17.8MB/s, the read speed is sufficient enough to stream full HD films comfortably from. All in all, there is plenty to like about this card. It is available from Memory Card Zoo for a not too bad but could do better £10.79. It is a little on the pricey side (for a 8GB card), but can you really put a price on data reliability? Other brands may offer more value for money, but at least with this you can be assured that your data is in safe hands, uhm, I mean card.